Editor's Note. This article is from the The Amicus Journal, spring 1983 edition, published by the Natural Resources Defense Council (NRDC). It is not an easy article to read and may indeed be one of the most disturbing things you've ever read. It chronicles the scandal that destroyed the credibility of the safety testing lab industry in the late 1970s and early 1980s, particularly Industrial Bio-Test Labs of Northbrook, Illinois. The article reveals the fraudulent practices of IBT and other laboratories, the horrendous treatment of animals, and the total disregard of human health and the integrity of the regulatory process. Many of the products the safety of which was declared falsely are still on the market. I first encountered this issue when covering PCBs in the mid-1990s and reported my findings in an article in Sierra, the magazine of the Sierra Club. With assistance of NRDC, which retrieved this nearly-forgotten article from its archives for us, we are able to offer it to Planet Waves readers. Special thanks to Raluca Albu at NRDC in Manhattan for her research assistance, and Tania Derck in Brussels for typing the manuscript. A sequel to this article, called "IBT Guilty," and a product list of pesticides approved by IBT Labs, will follow shortly. WITHIN THE FERVID, unseemly world that was Industrial Bio-Test Laboratories, the place where things turned gruesome was a room called “The Swamp”. In 1970, IBT’s directors installed a Hoeltge automatic watering system for one large animal feeding room midway through Number Three building. Although it was designed to fill drinking bottles and flush wastes from hundreds of rodent cages, the equipment rarely worked properly. Faulty nozzles sprayed the room with a continuing chilly mist, showering the caged animals. Water streamed off cages and racks, submerging the floor under a four-inch deep pool. Mice regularly drowned in their feeding troughs. Rats died of exposure. No technician entered the Swamp without rubber boots, and many wore masks to protect themselves from the hideous stench of disease and death. During the course of a two-year feeding study, involving more than 200 animals, the mortality rate in the Swamp reached 80 percent. Worst of all was cleaning the cages. Dead rats and mice, technicians later told federal investigators, decomposed so rapidly in the Swamp that their bodies oozed through wire cage bottoms and lay in purple puddles on the dropping trays. It was in conditions like these in the Swamp and four other major animal feeding areas that IBT conducted thousands of critical research projects for nearly every major American chemical and drug manufacturer, dozens of foreign concerns, and several federal agencies as well. Nearly half of IBT’s studies were used to support federal registrations of a mammoth array of products: insecticides, herbicides, food addictives, chemicals for water treatment, cosmetics, pharmaceuticals, soaps and bleaches, even coloring for ice cream. One of the nation’s oldest independent laboratories, during its last decade IBT was also the largest, performing more than 1,500 studies at its main facility in Northbrook, Illinois, twenty-five miles north of Chicago, and in two satellite laboratories in Neillsville, Wisconsin and Decatur, Illinois. It has been estimated that between 35 and 40 percent of all toxicology tests in the country were conducted by IBT. Still, for all its prosperity and spurious prestige, IBT’s business crumbled rapidly starting in 1976, when at the zenith of the lab’s corporate strength, investigators from the US Food and Drug Administration (FDA) uncovered what they alleged is the most massive scientific fraud ever committed in the United States, and perhaps the world. In May 1981, after a five-year joint FDA-Justice Department probe, Dr. Joseph C. Calandra, IBT’s president, and three of his top associates – Dr. Paul Wright, section head for rat toxicology; Dr. Moreno Keplinger, manager of toxicology; and James B. Plank, senior group leader for rat toxicology – were indicted in Chicago by a special federal grand jury. Each defendant is accused of eight counts of conducting and distributing fake scientific research and then of attempting to cover up the scheme. After several postponements, the IBT trial is scheduled to begin April 4. If convicted on all counts, each defendant faces up to forty years in prison and fines totaling over 40.000 US dollars. US attorneys in Chicago say the IBT prosecution will be torturous. Calandra and the other defendants claim they are innocent, and have hired the Midwest’s finest trial attorneys to make their case. In the months since the indictment, the defendants have filed stacks of legal motions seeking dismissal of the charges. They insist that FDA and Justice Department agents “harassed, abused, misled, bullied, intimidated and coerced” key witnesses, in order to prove their case. Chief FDA investigator Carlton Sharp is accused of “abuse of the grand jury”, because he knowingly presented “false, misleading and inflammatory” statements during his two grand jury appearances. Similar tactics were employed by defense attorneys, in two cases prosecuted several years ago by US attorneys in Chicago with distressing results. In the first case, the government gained an eleven-count indictment in 1977 against Velsicol Chemical for concealing key scientific results in the carcinogenicity of the restricted insecticides chlordane and heptachlor. The case was dismissed in 1979 on procedural grounds. US attorneys were turned away one more time in 1980 in a case against G.D. Searle, a major pharmaceutical manufacturer, accused of falsifying scientific research. In that case, Chicago prosecutors could not gain an indictment. In the IBT case, however, the prosecutors successfully have answered each motion. Frederick Branding, a former federal prosecutor who recently left the Chicago office, calls it "one of the most important cases ever investigated out of this office." During the trial, which is expected to last at least six weeks, prosecutors hope not only to prove the defendants' guilt, but will also outline a pattern of chemical company knowledge of fraudulent research taking place at IBT. They will also attempt to prove that those practices were promoted by chemical company executives, in order to secure results that would pass registration standards at the FDA and US Environmental Protection Agency (EPA). Said one Justice Department investigator: "IBT became the largest testing lab in the country, because companies knew this was the place to get the results they wanted." A primary example, prosecutors allege, is the case of defendant Dr. Paul Wright. Before he started work at IBT in March 1971, Wright was employed as a toxicologist by Monsanto in St. Louis. Prosecutors say Wright went to IBT to manage Monsanto's contract to test the safety of TCC, the company's anti-bacterial agent widely used in popular deodorant sprays. TCC was under suspicion by the FDA for causing testicular atrophy in laboratory rats fed the compound. At the same time, Monsanto was counting on TCC as a major product to replace hexachlorophene, another anti-bacterial chemical just withdrawn from the American market. Monsanto needed a "clean" IBT study to convince the FDA that TCC was safe so the agency would grant them a registration to increase the levels of TCC in deodorant soaps. Wright stayed at IBT for eighteen months, to supervise most of the TCC research then returned to Monsanto where he was named its manager of toxicology for its department of medicine and environmental health. While at Monsanto, according to prosecutors and witnesses, Wright wrote several critical sections of the final TCC summary report and pressured a key IBT scientist into changing his finding that TCC did, in fact, cause testicular atrophy in laboratory rats. The sections Wright authored were included in IBT's summary report, which was sent to the FDA. The agency eventually approved the new higher levels in some deodorant soaps. Millions of pounds more of TCC are now manufactured each year by Monsanto as a result. IBT's test on TCC was just one of 22.000 toxicology studies the lab performed in the quarter century it operated. Since late 1979, pathologists at FDA, EPA and in Canada and Sweden have undertaken an immense and complex program of auditing IBT studies. They have determined that more than 10.000 were used to register products for the American market, and they consider nearly 2.000 as primary research. Most of these were for 325 insecticides and herbicides. The vast majority have been declared by American and Canadian scientists to be "invalid." Until recently, the details of the joint investigation were untouchable as prosecuting attorneys, defendants and witnesses declined to comment pending the outcome of the case. Last December, however, as part of a motion to dismiss made by Calandra's attorneys, almost 1.000 pages of secret grand jury testimony and related documents were entered in US District Court, publicly revealing for the first the nauseating saga of IBT's demise. Most infuriating is the legacy left by IBT's scandal. There are few Americans who do not make daily contact with chemicals IBT tested and declared "safe" chiefly from pesticide residues contained in their food and water. Since the scheme was first pinpointed, some of those chemicals have been declared by federal agencies to be hazardous to human health and environment. Many others are accused by researchers across the country of causing illnesses and environmental contamination. In this continent and in Europe, health authorities have begun to take regulatory action against chemicals registered with IBT data. Sweden recently outlawed eight IBT pesticides. Last year, after studying IBT data on 113 pesticides, Canada outlawed six and severely restricted application of the fungicide Captan. In the United States, the EPA's final summary report on 212 pesticides registered with IBT data is due to be released in May, according to Kevin Keany, an official in the Office of Pesticide Programs (OPP). In other actions, the EPA has suspended the use of the herbicide Silvex, and cancelled most uses of the insecticide toxaphene and DBCP, all of which were registered with extensive IBT data. Still, one thing is all too clear: the magnitude of the IBT scandal may never be known, and its effect is likely to carry on for generations. There is nothing remarkable in the way Frontage Road runs alongside Interstate 94 in Northbrook. Like a hundred other two-lane industrialized corridors across America, Frontage Road is home to a dull array of squat motels, three-storey corporate headquarters and small manufacturing plants. It was here in 1953 that Joe Calandra established IBT. Then a 35-year old graduate of the Northwestern University School of Medicine, the young Calandra, according to colleagues, was a man of high scientific standards who also knew how to make a dollar. Calandra could foresee that a toxicology lab, which contracted its services, was very much a growth business of the future. All signals pointed that way. The federal government was increasing the standards required for registration. Manufacturers, pressed to account for the safety of their products, needed firms to prepare the scientific research. And Calandra, from the start, had a real prize for a client: the Pentagon. Between 1953 and 1977, in an effort to discover better ways to preserve food for the troops during war, the Pentagon paid IBT more than 8 million US dollars to carry out a long-term study in which irradiated beef was fed to mice and rats. The Pentagon was not the only US agency to contract IBT's services. In the early 1970s, the National Institute of Drug Abuse spent 972.000 US dollars on four long-term studies, one of which was to test the toxicity of methadone. The FDA too was a client. In 1974, the agency spent slightly more than 400.000 US dollars on four tests of their own. IBT grew quickly. Behind the first two administration buildings stood four nearly identical animal buildings, long and low, used to house IBT's horde of rats, mice, guinea pigs, dogs and chickens. Throughout the 1950s and early 1960s, IBT's growth lagged far behind the demand for its services. The lab's reputation circulated quickly through the science and development areas of corporate America. IBT's work was good, they said. It was moderately priced. Most importantly, it passed examination in Washington. While its finances were closely guarded, several estimates put IBT's revenues in the mid-1960s at close to 2 million US dollars annually, enough to attract the attention of the officers of Nalco Chemical (1981 revenues: 666.5 million US dollars), a specialty chemicals manufacturer based in Oak Brook, Illinois. In 1966, Nalco bought IBT from Calandra for a reported 4.5 million US dollars. Backed by Nalco's millions, Calandra began a program of expansion to turn his pioneering lab in to America's largest chemical testing firm. Two smaller satellite labs were built. In 1970, construction began on a 2 million US dollar, four-storey research building on the Frontage Road site. Calandra was also making several important staff appointments. Dr. Moreno Keplinger was named manager of toxicology in 1970, followed by James Plank's being named as group leader of rat toxicology. In March 1971, Paul Wright joined the staff from Monsanto, and in August, Dr. Donovan E. Gordon became IBT's pathologist. During the same period, events were occurring in Washington which turned a river of business IBT's way. The environmental movement, an infant in the early 1960s, had matured by the end of the decade, compelling President Nixon to establish the EPA in 1970. With the agency came the publication of dramatically more stringent regulations for pesticide registration and use, requiring a broad range of scientific studies. Though even the largest companies like Dow prided themselves in maintaining laboratories of their own, they too contracted with IBT. IBT thought it was ready for the new business and welcomed all its new clients. But it was soon in the position of having much more than it could handle. If they were not so serious, the continuing slapstick events at IBT might seem humorous. The first time Manny Reyna, an animal technician at IBT, was ordered out on a mouse hunt, he thought it was a joke. Armed with a plastic squeeze bottle filled with chloroform and outfitted in thick gloves and a white lab coat, Reyna joined a squad of technicians in a search-and-destroy mission of rats and mice running wild at IBT. Soon after he was hired at IBT in May 1971, Reyna realized that not all the rodents he tended finished their lives in cages. 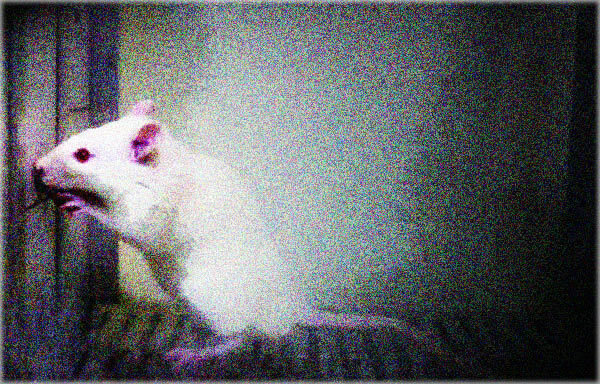 Every week, dozens of research mice and rats squeezed through the bent wires of IBT's mangled cages, raced across the long wooden racks and dropped to the grimy floor to breed with wild rodents living behind tall stacks of animal bedding piled in the corners of the lab's feeding rooms. During the night mice climbed back up the racks to feed on spilled food and feces, and they persisted in poking their snouts through the bottom of cages. "For some reason, they would cannibalize the toes of the animals that were standing on the wire," Reyna testified in his grand jury appearance. “In the morning we would see where the toes had been chewed off. So, you know, we were at a loss as to what to do... It was a never-ending battle." The only temporary solution was a mouse hunt. For hours the armed squad would flush rodents from cover and douse them as they skittered past. "The animals were very wild,” Reyna testified. They would run from humans. So our only chance was to slow them down with the chloroform." Once snared, technicians sacrificed their bounty, throwing the carcasses into plastic bags, and then tossing the mess into trash heaps behind the animal buildings. Reyna had other choice stories for federal investigators. More than once, he said, rats on two-year feeding studies were fed the wrong compound, something IBT never reported to its sponsors. Then there was the time the air conditioner in the brand new research building quit, and technicians hauled half a ton of ice to the third floor, setting up fans behind the blocks to cool hundreds of animals housed there. “It was a mess, and of course the temperature didn't change but a degree or two," Reyna said. Occasionally mouse hunts would get out of hand. During the course of the Pentagon's irradiated beef study, Reyna claimed the hunt became so enthusiastic that chloroform fumes killed dozens of caged research mice. "I don't know how many mice died that were on tests," he said. "It was just amazing; it was a substantial number like 50." Was the test halted or was its sponsor notified? "No, the tests continued," according to Reyna, "I think they just filled in the gaps." Wherever Reyna looked there were follies to be witnessed. One of his responsibilities was keeping track of frozen tissues, which needed to be stored in the main freezer upon arrival from IBT's satellite labs. One day a panel truck backed up to IBT's receiving dock loaded with twenty-five or thirty boxes of frozen tissues. Later Reyna found out that Gerald Kennedy, a high IBT official had arranged with a meat processor in Wisconsin to butcher hogs involved in a skin burn test at the Neilsville lab. “So he had all of this meat processed and sent to us evidently under the guise of being sample tissue for a sponsor," Reyna told federal agents. "Meanwhile, I had to just about nail that freezer door shut to keep it from popping open. I mean that freezer was just packed." The Justice Department's prosecution, headed by Deputy Chief of Special Prosecutions Scott Lassar, involves fraudulent research alleged to have been conducted on four compounds: the insecticide Nemacur and the herbicide Sencor produced by Chemagro, now owned by Moby Chemical; the drug Naprosyn manufactured by Syntex to treat arthritis swelling and Monsanto's anti-bacterial agent TCC. On April 14, 1971, IBT began two long-term feeding studies for Chemagro's newest agriculture chemicals. The company hoped that Nemacur would compete with Dow and Shell's popular soils fumigant DBCP. Sencor was a multi-purpose herbicide. Chemagro's protocols for the two studies called for feeding two groups of mice for eighteen months. In addition, a control group would be established and fed a known animal carcinogen, in order to make comparisons with the results found in animals fed the test compounds. On June 19, 1972, IBT sacrificed Chemagro's mice studies, fourteen months after they began. This was not reported to the company until the summer of 1977, when IBT's testing had nearly come to a halt. In late July or early August, Philip Smith, then a 25-year old technician at IBT, was assigned by Dr. Wright to prepare the final summary report for the two studies. At the same time, Wright handed Smith a completed mortality table detailing the number of mice that had died and the dates of their deaths. It showed that almost no mice died prematurely. Smith told the grand jury that he knew immediately that the table had been faked. How? Michael Black, the technician who tended to the feeding study, had told Smith that the mortality of the mice on Chemagro's tests had been enormous. In fact, Wright ordered 1.000 new mice to take the place of mice that died during the test and specifically ordered Black not to report the addition in his records. Attorneys for Monsanto said Wright would not comment on these or any other allegations until the trial. During the first week of August, after Smith completed the reports, he was called into the office of Moreno Keplinger where he learned of another problem. Dr. Wright was waiting there too. Keplinger told Smith he was worried about the results from the control group for the Chemagro studies. So few mice had survived that the results from the control group did not really demonstrate the animal's susceptibility to developing cancer. Keplinger said he was not going to report the study. Instead, he had a solution. IBT had just completed a long-term mouse study for another company, and the control group for that study had been painted with benzidine. It did not matter that Chemagro’s protocol called for feeding benzidine to mice. Smith said, Keplinger simply calculated that the amount of benzidine painted on the skins of the mice was comparable to a dietary level of 1.000 parts per million. Smith testified he was instructed to recalculate the control group figures and insert them into the Chemagro report. That is precisely what Smith did, spending at least 60 percent of his time during the next four or five months formulating a cogent numbering system that would pass Canadian inspection. In December 1973, Smith finished and IBT mailed its response to Chemagro. IBT’s report was accepted by both Canadian officials and the EPA. Nemacur and Sencor were registered for use in the United States in 1976. Later the EPA ruled the tests invalid and asked Mobay to repeat them. In April 1982, duplicate mouse studies were mailed to the EPA, reviewed and regarded as satisfactory by EPA toxicologists. Both chemicals are widely applied across the country. One of the companies attracted to IBT during its expansion periods was Syntex, a pharmaceutical manufacturer based in Palo Alto, California. In the late 1960s, Syntex scientists developed a drug called Naprosyn which they hoped would revolutionize arthritis treatment. In March 1969, a small group of Syntex leaders visited Calandra in Northbrook and toured the IBT facilities. Several months later they signed a contract with IBT for a twenty-four month rat feeding study, which included detailed protocols for blood chemistry and urine analysis data to be recorded throughout the course of the study and at the time of final sacrifice. In November 1969, IBT began the study. In September 1971, just twenty-two months later, IBT sacrificed the Naprosyn rats. This was not reported to Syntex until 1976, when the FDA alerted corporate officers. Once again, Phil Smith was assigned to write the final report. But in October, when he began working on the blood and urine sections, he could not find the data. He searched in the animal department files and found nothing. Then he went to the clinical pathology lab and found a file containing blood and urine data through the fifteenth month of study, and a note which said the final blood and urine work had been postponed. Smith tracked down Ron Greco, the manager of the lab, to find out what it all meant. Greco was not sure. So the two men poured through the lab looking for the data, searching the freezer for serum samples, scrutinizing scheduling records, looking in slide files and time charge records. Nothing. When they were finished, the men concluded that the final blood and urine work had not been conducted. During the next week, Smith completed a hand-written rough draft of the report and left the data tables for blood and urine tests blank. Smith testified that he took the uncompleted report to Wright’s office, told him the tests had not been done, and said he would not sign the report. This is where the missing pages 20 + 21 (listing) are supposed to be!! Then he turned to the signature page and was shocked to see his name written in. Things got even stranger a few days later when Smith's rough draft was returned from IBT's typing pool. He turned to the blood and urine summary tables and discovered they were filled in by what Smith "recognized as Mr. Plank's handwriting and some [data] in what I recognized as Dr. Wright's handwriting." In an interview with FDA agents in May 1980, James Plank “denied that he knowingly inserted false information in this report when he prepared it." Plank did identify his handwriting from the rough draft and said he prepared some of the tables. But Plank advised the FDA that he was sharing an office with Wright at the time and "he was often given reports to plug in the data by Dr. Wright." To revise the report, Keplinger asked IBT’s pathologist, Donovan Gordon, to evaluate stomach tissues taken from the Naprosyn group. Through the microscope, Gordon saw lesions on the tissues caused by anemia and which he concluded were “induced by the drug.” To support the findings, he wanted to look at the raw blood and urine data. He called Dr. James Von Druska, supervisor for the Clinical Pathology Lab and asked him to send the data over. After another thorough research of the pathology lab, Von Druska called Gordon and told him the data could not be located. As a result, Gordon referred to the numbers published in IBT’s final Naprosyn report, and when he saw that all the values appeared normal, he revised his conclusion, stating that the animals died of lesions common to the stomachs of lab rats. Meanwhile, back at the clinical pathology lab, enough questions had been asked about the missing data that Von Druska consulted with Gordon, telling him it appeared the work had not been done, yet the numbers appeared in the report. The two men decided to bring the problem to Moreno Keplinger. Dr. Keplinger did not seem overly concerned, Gordon told the grand jury. He listened briefly to the men who had come to his office and then waved them out. “I’ll take care of it,” Keplinger said. In early 1972, IBT revised the Naprosyn report for Syntex and included an appendix detailing Gordon’s tissue findings. They mailed the package on March 3, 1972. Three weeks later Syntex mailed the reports to the FDA and were granted a registration soon after. Syntex has repeated the rat feeding study, and Naprosyn is currently one of the company’s major sellers. In early June 1971, two months after he arrived at IBT, Paul Wright called Phil Smith into his office. He told Smith IBT was starting four new long-term rat feeding studies, one of which Smith later learned was for Monsanto’s TCC. The study protocol called for feeding low, medium and high doses of the compounds to 210 individually caged rats housed in the Swamp. In addition, a large control group would be “gang-caged” in the room across the hall from the Swamp. Under ideal lab conditions, the most critical factor in chronic feeding studies is to find out why animals die. Was the test compound responsible? Or was there some other reason? Only careful autopsies and microscopic pathological evaluation could determine the true cause of death. But dead animals were so commonplace at IBT, that most were simply taken from their cages and thrown away without examination. Within weeks of the start of the TCC research in the Swamp, the familiar acronym, TBD/TDA, began appearing all over the internal summary sheets. It is also clear from the grand jury testimony that Calandra, Keplinger and James Plank were also aware of the conditions in the Swamp. In fact, Calandra was known to call the room “Plank’s folly”, because it had been Plank’s idea to install the watering system. Still, for at least three years after the system was built, according to grand jury documents, dozens of tests were conducted in the Swamp, while it remained a turgid den of death. Eight months into the TCC study, in February or March 1972, Wright assigned Smith to prepare a six-month status report. Wright also handed Smith summary mortality tables which incredulously reported no animal deaths during the study’s first six months. At about the same time, a technician by the name of David Penner, who worked in the Swamp, was told by Wright to replace dead individually-caged-rats in the Swamp with animals gang-caged across the hall. Penner was expressly forbidden to make reports of the switch. Penner was also told to order new rats from a supply house and start an extra group of animals, later named the “research study” group, which would be used to replace dead animals. One of the organs for TCC that FDA had identified was the testicles of male rats. In June 1972, a year after the TCC study had begun, pathologist Gordon began the first in a series of microscopic examinations of testicular tissues taken from some sacrificed rats. Gordon’s first evaluation from the highest dose males revealed that TCC did cause testicular lesions. When he reported the finding to Wright, Gordon was told to take tissues from medium- and low dose group males as well. During the next few months, Gordon Found degenerative changes in these groups, but concluded that the lesions in the low-dose group were not related to TCC. If Monsanto and Wright drew a breath of relief, Gordon was never aware of it. The following November, Monsanto would be meeting with a FDA panel studying TCC to talk about TCC’s safety. Company officials wanted to make certain that Gordon, who would also be at the meeting, would back them up. So on October 11, 1972, a few days after Wright left IBT, Gordon was summoned to a meeting in Des Plaines, Illinois, to discuss TCC with Dan Roman and Ira Hill, two Monsanto scientists. They grilled Gordon about his TCC findings and instructed him on how important it was to emphasize “a good presentation” to the FDA panel on TCC. On November 18, Gordon was accompanied by Hill and Roman to FDA headquarters in Rockville, Maryland. On the plane, they again discussed Gordon’s presentation. Once there, Gordon performed to their expectation. Minutes of the meeting record that the pathologist never mentioned the treatment-related effects he had found. The meeting lasted for hours. Of particular concern were Gordon’s findings, reported in a preliminary report that testicular lesions caused by TCC were found in rats fed large and small doses of the compound. He told the group that age, nutrition, the conditions of the rats and stress could account for the effect, and he urged Calandra and Keplinger to convince Gordon to change his conclusions. Between October and February, Kennedy assisted by Keplinger and Gordon, worked on the final report, which was mailed to Monsato on March 21, 1974. There was no further word about it until October 10, 1974, when Wright wrote to Keplinger requesting the pathology data and tissues for rats fed the lowest doses. In late December or early January 1975, Calandra called a staff meeting to discuss the TCC study. It was attended by Keplinger, Gordon, Jim Plank, Kennedy and Dr. Florence Kinoshita, a toxicologist who joined IBT’s staff in September 1973. Just the year before Dr. Kinoshita had been a member of the FDA panel investigating the compound’s effect on laboratory animals. When all the participants entered the room, Calandra raised the TCC final report over his head, slammed it down on the table and said, “This thing isn’t worth the paper it was printed on.” Calandra then launched a long discussion of the report. "Calandra was extremely concerned," Kennedy said. "He did not want to admit to the FDA that the study report could not be substantiated by the raw data, i.e. the study organization was false, the mortality table was false, the purpose and use of the so-called research animals was false, etc." It was decided that Dr. Kinoshita was to prepare a revision of the TCC records. Still, the most important conflict in the study continued to be Gordon's findings. On January 22, 1975, Paul Wright and Dan Roman returned to IBT for another meeting with Calandra, Keplinger, Plank, Gordon and Kennedy. Again, Gordon's conclusions were criticized as unfounded. A month later, on February 21, 1975, virtually the same group convened again at IBT and again the same problems were discussed. By this time Kinoshita had completed her revision and it was handed to the Monsanto staff members before they left IBT. Monsanto continued to be dissatisfied with the pathology sections. On August 25.1975, Calandra directed Dr. Gordon to meet with Dr. William Ribelin, an independent pathologist hired by Monsanto to review the tissue slides, in Madison, Wisconsin. Gordon knew Ribelin and the two scientists agreed to meet alone for lunch before convening with Wright and another Monsanto official in an afternoon meeting. Over lunch, Ribelin and Gordon compared notes on the TCC tissues and agreed that “there was a treatment related effect involving all three treatment groups," Gordon said. Ribelin also gave Gordon a handwritten copy of his report for Monsanto in which he stated his conclusions, and cautioned Gordon to keep the report secret. Later in the day, the scientists met with Wright and told him that testicular lesions in all three dose groups were caused by TCC. Finally, in late January 1976, Calanadra called Gordon into his office to discuss the lesions. Like Wright, Calandra tried to convince Gordon that the lesions could be explained instead as manifestations of age or stress or the conditions of the rats during the study. Gordon did not agree. Then Calandra hit him with a last solution. He asked Gordon if there had been significant decomposition in the rats he studied. Gordon answered that in some animals there had been decomposition but in others there was very little. Calandra paused a moment and then told Gordon that he was going to remove the pathologist's findings from the report and say instead that decomposition "precluded meaningful evaluation of the testicular tissues." In short, IBT would report that the tissues could not be examined, because the tissues had rotted. “It was my opinion at that time, and is today, that postmortem data were removed from the report, because they incriminated the TCC compound," Gordon told the grand jury. On February 3, 1976, Gordon was called to Calandra's office for a showdown. Waiting for him there were Keplinger and Kinoshita. They handed him a copy of the TCC final report, now in its second revision. Calandra told him to sign it and Gordon complied. "I did not want to leave IBT at the time, so I succumbed to my boss's interpretation... even though I knew he had not examined the slides," Gordon said. The next day, according to Kinoshita's grand jury testimony, Dan Roman hand-delivered a revision to the pathology section "written by Dr. Wright." In substance, the revisions stated that there were no lesions found on male rats fed the lowest doses of TCC and that some pathology review was prevented by decomposition. Kinoshita and Keplinger stayed with Roman in the administration building conference room while they waited for Wright's revisions to be typed into the final report. On May 10, 1976, IBT mailed the TCC report to Monsanto. It had been backdated to March 21, 1974, to appear as though there had been no changes. On May 11, Monsanto mailed the report to the FDA. The agency eventually approved higher levels of TCC in deodorant soap. Millions of pounds of the chemical are manufactured annually, though Monsanto insists that a person would have to eat two dozen bars of Dial soap every day for years to be in danger of a toxic reaction to TCC. Dr. Adrian Gross, then a pathologist with the FDA, was the first to put his finger on IBT in April 1976. Several writers have described the event as a matter of chance, but that is only part of the story. Nine months earlier, Senator Edward M. Kennedy began the first series of historic and sensational hearings on Capitol Hill in which it was publicly disclosed that scientific research being conducted by the nation's drug industry was being deliberately falsified. The following January, officials of the EPA admitted that they were finding evidence of the same kind of shoddy scientific research in their files. It was in this atmosphere that Gross initiated a program of random spot checks of recent testing reports submitted by manufacturers to the FDA. One of the reports pulled from the files was IBT's Naprosyn study. As soon as Gross looked at the mortality tables, he suspected something was wrong. “None of the rats had developed cancer," Gross said in a recent interview. “Now, any pathologist knows that rats and mice on these long-term studies develop cancer naturally and will have a certain level of mortality. IBT's study said the rats were all clean." With one of the government's best and most tenacious pathologists on the case, IBT's scheme unraveled quickly. On April 11, 1976, Gross made his first visit to IBT to look at the raw data for the Naprosyn report. He returned on July 12. During these visits, Gross saw for the first time IBT's use of TBD/TDA acronym. He also saw the rats listed as dead in one section of the study, suddenly reappeared alive in another section. "Now IBT did some strange and unusual things," Gross says, "but bringing back the dead wasn't one of them." Gross's first visit set off a near panic at IBT. A week after he left, Calandra called a staff meeting in which fourteen employees were present. He notified them of the visit, and announced formation of an IBT audit group to research raw data on several studies. His plan was to minimize the damage, confine the FDA's investigation to a few specific studies, and emerge at the end with his lab's reputation and its lucrative business intact. By 1976, according to New York Stock Exchange reports filed by Nalco, IBT had revenues exceeding 9.5 million US Dollars annually. But Calandra's plan did not work. Not only was the FDA interested in Naprosyn, it also began probing the TCC study and several others prepared for an array of manufacturers. The EPA was notified, and began pulling IBT studies and noticing faults. By the end of the summer Calandra and his staff were shuttling between Chicago and Washington for intensive meetings with the FDA. Convinced that Calandra was not going to cooperate, the FDA began making plans for a criminal prosecution. To insure that the prosecution would be successful, the agency needed to secure IBT's internal documents. The FDA has no subpoena power, so in 1977 it turned the case over to the Justice Department. In a January 5, 1977 memo to his superiors, Adrian Gross warned them to act fast. He was worried that IBT would destroy incriminating evidence. “I believe immediate action on our part is indicated," Gross wrote. But IBT already had begun a program of shredding data, according to Gross and other investigators. Much of the raw data for IBT's studies on the herbicide 2,4-D was destroyed, federal agents say. And data for at least six other pesticides is missing. Moreover, agents are convinced that hundreds of letters between Calandra and company officials showing chemical company knowledge of IBT’s fraud were also destroyed. Nevertheless, many suggestive leads remained when the Justice Department finally seized 30.000 IBT documents. Through the years, six corporations have sued IBT and Nalco for breach of contract. All have settled out of court, and as part of the settlement the amount of dollar damages has remained a secret. A seventh suit, brought by shareholders of Syntex, claiming significant losses when the FDA's investigation was announced and Syntex, claiming significant losses when the FDA's investigation was announced and Syntex stock plummeted, was won by the plaintiff in US District Court in New York. Paid damages against IBT, Nalco and Syntex amounted to 2.8 million US Dollars. Joseph Calandra stepped down as IBT's president in March 1977. He still lives in the Chicago area and teaches pathology as a professor at the Northwestern University School of Medicine. Paul Wright continues to work for Monsanto. James Park left IBT a month after Calandra and is living in the Buffalo area. Moreno Keplinger left IBT and, according to his attorney, is working as a consultant in the Chicago area. As for IBT, there are nine people still working at the Frontage Road site, validating research for former clients who may still have questions. One of them is Donovan Gordon. The satellite labs have been sold, and the main lab is on the market. Asking price: 2.7 million US Dollars. The rats have been shipped out and the Swamp is just a room with a concrete floor. Looking at IBT now, it appears as torpid as any other building on the street. Then the images come rushing back - rats in puddles, mice drowning, filthy animal rooms - and with them a realization that what occurred here was worse than we may ever know. Copyright by NRDC and The Amicus Journal, Spring 1983, all rights reserved. Fair Use Notice: In accordance with Title 17 U.S.C. Section 107, this material is distributed without profit to those who have expressed a prior interest in receiving the included information for research and educational purposes.